The 460 Smith and Wesson Magnum, or 460 S&W, is a very potent and is powerful revolver cartridge designed for hunting. The famous phrase I use a 45 because they don’t make a 46, well unfortunately that phrase is still true. Even with the 460 S&W moniker, the bullet is still a 45-caliber projectile. 460 ammo uses lengthened 454 Casull brass as its parent case. 460 ammunition is significantly more powerful than the 454 Casull. The 460 Smith and Wesson and revolvers chambered in it are capable of firing a variety of different rounds due to their common case lineage. This includes 454 Casull, 45 Colt, and the 45 Schofield. 460 S&W ammunition is by far the most powerful round, and is capable of projecting rounds as heavy as three hundred grains at fifteen hundred feet per second, and rounds as light and soft as 200 grains at two thousand three hundred feet per second. This translates into a massive energy transferred into a target. 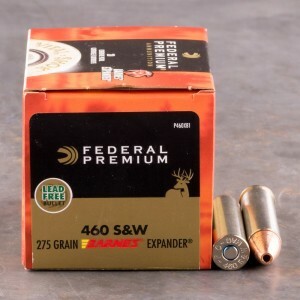 460 ammo uses the complete length of the Smith and Wesson’s X frame cylinder to produce an extremely efficient cartridge that is capable of a very high powder load. This allows the 460 S&W fired from a pistol to achieve the same power as a standard lever action rifle from a magnum pistol round. This is hard hitting ammo with a bit less recoil than the fusion 260gr. I’m a precision paper puncher, so I can’t speak to it’s hunting effectiveness, but I know it was sure fun to shoot!! Like shooting a polaris missile, the flame was at least three feet long! Very accurate even out of my S&W 460ES with the 2 and 3/4 inch barrel! The recoil will definitely smack you around, but so what! I love it!